We'll all understand that there's a difference between playing solo and playing in a team. And since you can do most of the leveling phase within FFXIV solo, it will make the transition to the team play even harder. The reason behind this is that playing solo often means defeating your opponent as quickly as possible making use of all your assets, where playing in a group only requires you to play on the strengths of your character. Now a days most roles in MMO's are simplified towards three roles: Tank, Healer and DPS (short for Damage Per Second), back in the older days there was a much larger variety of roles, but we'll get to that later. The reason behind the three roles is quite simple. The Tank is there to soak up all the damage from the enemies so that the Healer has an easier job keeping everybody healthy (which in the perfect scenario would only be the tank). All while the DPS are taking care of defeating the enemies. Whats important to note about this party setup however that it works entirely around Enmity control. The whole thing either works or falls depending whether the team can correctly control the Enmity. Before we talk about the Enmity control we'll first need to explain what Enmity is. And in the most simple for of speaking Enmity is the indicator that decides which character an enemy is attacking. Apart from a few exceptions the enemy will always focus his attacks on the person with the most Enmity. For some characters this is a good thing and for others it isn't. Within FFXIV there are 3 ways to see what your Enmity level is. The first is also the most useless and are the red lines drawn from an enemy to the character that has drawn the Enmity for this creature. While a nice indication that something is terribly miss the lines will be easily missed in the heat of battle. The second indicator is the Enmity bar next to each of the party members. At default its located in the top left corner and forms key information for Enmity control. The higher the bar the more Enmity you've generated and the character with the highest bar is usually the character that will get all the attention of the enemies. The last indicator is by default located on the bottom left corner. This indicator is a personal indicator and will tell you your personal status for each creature. The indicators are both visually telling the Enmity level through the color and the shape of the icon. A Red Square (flashing) means that you are the target for the mentioned creature. A Yellow Triangle means that have drawn some attention, but you've got nothing to worry about yet. A Green Circle means your fully in the save zone as far as Enmity concerns. I've told you how you can see your Enmity towards enemies and with it comes the question "What has it to do with me? Enmity control is something for the tank." This is a commonly made mistake in many groups. So many times I've heard people complain about bad tanks that can't keep the Enmity. Surely there are some tanks out there that haven't gotten a clue how to control the Enmity, but more often the answer to your problem might lie with yourself. Sure its the tanks job to keep the Enmity on himself, but its not really hard to get the Enmity of him. The damage dealt by a DPS spikes heavily above that of the tank (obviously) which generate huge amounts of Enmity even casting cure generates a huge amount of Enmity let alone stronger cure spells. This is especially true when the tank is at a lower level or has weaker gear than the rest. "Does this mean I have to stop attacking as a DPS?" The answer to that question is simply YES. Whenever you notice that you are generating more Enmity than the tank its better to hold of for a second or 2 than to keep going and draw the creature towards you. This even goes for the Healer who should stop healing (if possible) to prevent the Enmity from switching over. Sure as a DPS you can probably tank a creature or 2, but this often means the healer has to spend a few (unnecessary) cures which means he'll generate Enmity. This on its turn might cause the creatures to attack the healer which then has to heal even more generating even more Enmity. In lower dungeons this might not be the biggest problem, but in later dungeons this endless cycle is one that usually ends with a party that gets wiped out. So as said above keeping control of the Enmity is a job for the entire team. Its the tanks job to generate as much Enmity as possible and the rest of the group should do everything they can to keep there Enmity below that threshold, even if this means to hold your chocobo's for a moment. As said above there are many roles within a party, but these days most MMO's have simplified these roles to 3: Tank, Healer and DPS. The roles below are the roles in a party for FFXI. While the roles itself might not appear in the duty finder they form the basis for any end game party. Note that a character might take on more than 1 single role in a party. Tank => Its the tanks role to soak up all the damage of the creatures. To do so the tank should be able to cast spells that draw the Enmity towards him and keep it on him whiles also minimizing the amount of damage he takes so that the healer can keep up with the damage he takes. A good tank will put the well being of the party above his own. Communication with the team is vital for the Tank. He's the one that should give the direction on which creature to focus, whiles also keep up the communication with the healer as to when he's able to keep up a good defense or requires some extra healing. Healer => Its the healers job to keep the party alive be it through the use of curative spells or beneficial status effects. The main focus of the healer is most likely the tank as he's the one soaking up the damage, but a healer should never forget the rest of the party. The healer will most likely spend most of the time watching the HP bars of the party members whiles also keeping an eye on his on MP. He should find the right balance between keeping up the HP bars, draining his own MP and the generating of Enmity. Only by finding the balance between the 3 will the party prevail. Damage Dealer => Its the role of the damage dealers to do as much damage as possible. Its the task of the damage dealers to strike down the creatures as fast as possible whiles keeping the Enmity on the tank at all times. This means they need to know there own limits and that of the tank to find the right balance between dealing damage and generating Enmity. A good damage dealer will never draw the Enmity of a tank as this will cause problems for the Healer and will more than often have deadly results. Support => Its the supports role to support the rest of the team through beneficial status effects. This can be by enhancing the damage output of the damage dealer; Regenerating MP of the party; Increasing the defense of the tank; Heal additional party members to reduce the load on the healer; Whiles the support doesn't have a direct impact on the fight, it should be his job to make it easier for the rest of the party to do the things they are suppose to preform. Puller => Its the job of the puller to lure new creatures towards the group. Most preferably the puller is a ranged damage dealer, this way he doesn't have to spend resources to pull in new creatures. A good puller knows the limits of his party and will only pull in new creatures when he knows the rest of the party is ready to receive them. Within FFXIV this role is more often merged with the Tank, but with the right communication you can let other people preform this task as well. Secondary Healer => More than often having a single healer in your group isn't enough. During this time its the secondary's healers job to fill in the pieces that the main healer can't fill in himself. This might be healing up the rest of the party while the main healer is focusing the tank; Proving the team with beneficial status effects whiles removing negative status effects so the main healer can focus on healing; Providing additional AEO healing against bosses with bosses with many AEO abilities; Or simply having a tag team duty with the main healer to take over each other over once the other has ran out of MP. Whenever you play with more than 1 healer they both should know there task as healer to prevent them both from doing the same thing. Thought this little background information about Enmity might help out a few people, also if you got any add-on or remarks let me know and I'll update them into the post. Post your characters/server data so we know whom to add to our friends list and where we can find you. Please only make 1 post and update it should anything change, that way we can keep it easier to find everything. Viral Smoke => Deals damage to party and can inflict Virus. Bio => Deals damage to party and can inflict Poison. Wings => Deals damage to a single target. Venom Powder => Deals damage to a character and inflicts Venom. Lance of Atrophy => Turns a single character into a Zombie. Banish => Only cast on Aeons instantly killing the Aeon. Full-Life => Restoring a dead unit to full health (or intantly kills a zombified unit). Cross Cleave => Massive damage to entire party. Mortibsorption => Used when Mortiorchis died. 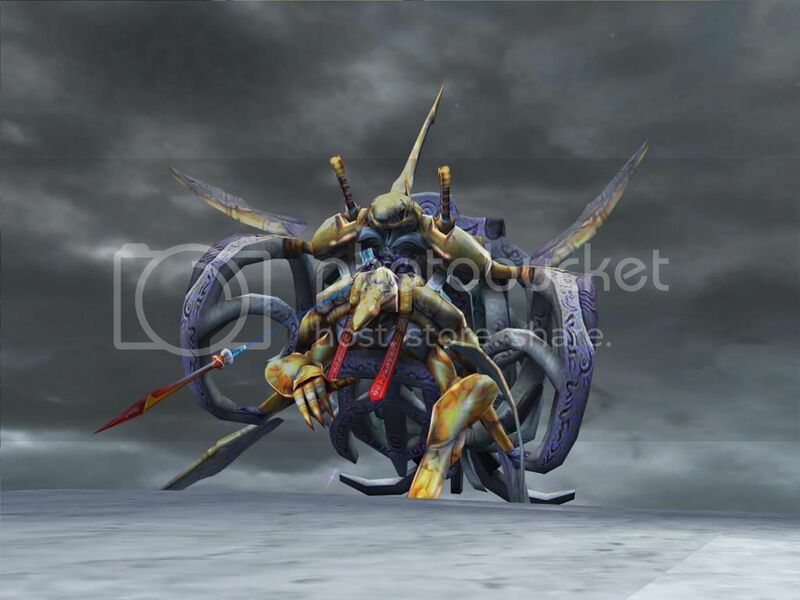 It absorbs HP from Seymour (current max HP - 1.000, with a minimum of a 1.000 HP) dealing equal amount of damage to Seymour. 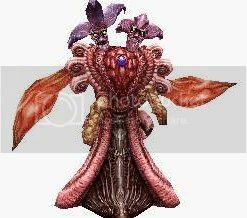 In this board I will regularly (most likely once a week) post a boss battle from the Final Fantasy Series. The idea behind the board is to post your strategy to defeat the boss. Once a few strategies have been posted we can compare them and come up with the most efficient way to defeat the given boss. This input will later on be used to fill up the bestiary with helpful information for those who have yet to play the game. Notice that there are often different ways to beat a boss as most people have different play styles and use different characters. The whole point isn't of this board isn't to find the best strategy, but to cover an broad area of strategies. Including not only strategies for a normal play-through, but also speed-runs, low level games or any other popular challenge for the specific game. Note that this board may contains spoilers, so be warned when you open a topic of a game you haven't played/finished. Sandsea / Bringing back some activity to the forum? The forum on itself is now almost 5 years old and that on itself is already an achievement, but I hope I don't speak for myself if I want to at least set the next goal on 10 years. My own personal dream would be to turn this place in a knowledge center 2.0, where people who are in the need of help with Final Fantasy related stuff could come and get help on any level. Be it on the level of somebody who's stuck during a normal play through to the place where discussions can take place on how to beat the game on low levels. We once where this kind of place with FFXII, but when FFXIII came around it seems people got split up and found other places as well. - Cleaning up the amount projects around the forum and the website. During the course of these 5 years I've made quite a few side projects, one might say that one because a bigger flop than the other, but I think its time to clean up the house and remove most of them. In this cause it would be the wiki and the triple triad place. The first I will try to integrate into a new main website which has a more friendlier interface than the wiki itself and the later as it hasn't been updated in the past 2 years and in its current state it would be more of a back-door for hackers than its actually used. Those 2 points are most be on my part and I've got a few more ideas spooking around in my head, but I need to make these more specified than they are right now. As they are mostly just stuff I would like to do, but have no clue on how to, for example setting up some form of a final fantasy radio on this place. With the 2 of the 4 Beta phases already completed Square Enix finally found it time enough to announce the Release date. And so as of today we have finally a day to look out to which will be August the 27th. The release will be worldwide and both the PC as the PS3 users will be able to start there adventure at the same time. With a release date its only natural to announce the collectors edition of the game as well. First lets get going with the people who would be interesting to help out. The games you guys are interested (maybe even a common theme). And so on. The Beta will start mid-February. The Beta will be divided in 4 phases. Each phase will last roughly 2-3 weeks, which 1-2 weeks of debugging behind. Sandsea / MOVED: Where did all the remakes go? This topic has been moved to Final Fantasy. News / First FINAL FANTASY XIV: A Realm Reborn Trailer Released! Square Enix has just released the first trailer for FINAL FANTASY XIV: A Realm Reborn (in other words FFXIV 2.0). 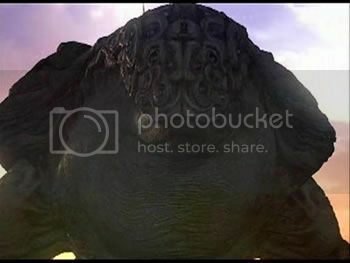 The trailer is entitled The Fate of Eorzea and shows the transition of the current storyline into the 2.0 storyline.